Last night I had 4 inches of rain. This morning I have water in the basement and a collapsed chicken tarp. But it could be worse. The water in the basement amounted to about an inch. I pumped it down to about .25 inch or thereabouts. The pump can’t work with less than that. The chicken coop is still covered by the chicken wire, if no longer quite as secure as previously. The tarp is still held up on two ends. The chickens were unperterbed by the events of overnight. I’d cut a slit in the tarp to drain rain water and so it wouldn’t puddle, but I guess I need more slits for four inches of rain. The good news? I can forget about that 4 inch rain deficit. I slept through most of the event and certainly didn’t realize how much it was raining until I got up this morning. That’s when I saw the lane and my driveway, which now will require a four-wheel drive vehicle to get in and out or up and down the mountain. Fortunately, I have one of those. Well, at least it’s Friday. Presumably, the chickens will remain okay until I can get another tarp tomorrow. The forecast is for scattered showers today. I hope the scattering isn’t over my cabin. Saturday is supposed to bring clearing skies, and I’m ready for those. This morning as I was leaving the cabin I found this fern, still rain drops still in place. 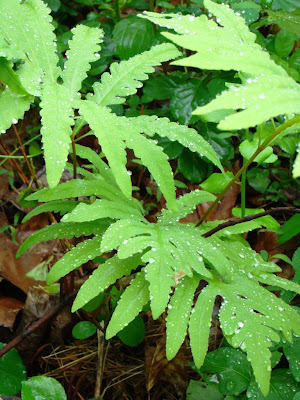 It’s a sensitive or bead fern (onoclea sensibilis in case there’s a different common name for it in your area). The woods look lovely this morning, raindrops on everything. The greenery is so thick that a jungle pales in comparison. Funny, I never thought I’d ever get to live in a rain forest. Mist, fog, rain, humidity are the watchwords around the cabin right now. Plants that don’t need sun are thriving. Some of the more sun-loving foliage is starting to look a little starved. For me, ambition to work outside the cabin when the weather is like this is flagging. Even when it’s not raining, I return inside soaked just from walking around the perimeter of the cabin. Holding back the edges of the greenery that creeps ever-closer turns into a major chore. Easier to just wait for the eventual reappearance of the sun and a day of drying than to attempt something today. Or so I tell myself as the forecast for more of the same stretches further into the days ahead. This is the kind of weather where my observational techniques for weather forecasting do little good. I can’t see any sky, as it is hidden by dense fog. Studying the sky for clues about weather to determine when a storm is coming or what the day ahead may hold works fine, but I have to see the sky to do that. Often, I can tell what the weather is going to be a full day, sometimes even longer, ahead of it actually arriving. When I’m in the middle of fog or even rain or snow, I’ve found it impossible to tell when it’s going to end by looking overhead. By the time I can see the sky again, I know the weather is going to clear. But when I’m in the middle of the event, I can’t see the end of it. That’s where modern radar has a real advantage over the old ways. Today, even the modern forecast doesn’t help much. Clearing weather is still at least two days away, and even that seems to be a moving target. Still, it’s something. I take for granted having that radar and those satellite photos, but both are quite modern advances. 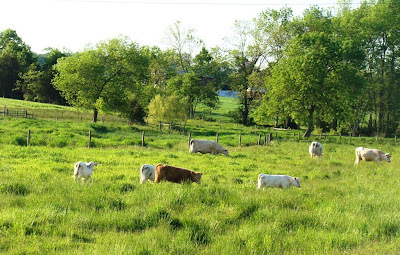 I try to imagine a farmer’s worries in the days before them. Or how it must have felt in winter a thousand years ago during a blizzard. Will it end in an hour or three or will this storm rage for days? That must have been a whole other level of anxiety that I don’t have. Thankfully. Roundtop is encased in mist and rain right now. Last night was so chilly that I briefly toyed with the idea of turning on the heat again. But I resisted the impulse, dug out a sweater I’d put away a few weeks ago and tossed another blanket on the bed. That worked well enough, even though the temperature in the cabin dropped down to 59 degrees. The reason it was so chilly is that the bedroom window is open a bit so I can hear the chickens squawking in case anything attempts to breach Ft. Knox. Normally, I close the window when I go to work, but yesterday, perhaps out of practice after three days off work, I forgot to close it. It’s not just mist and rain that encases me right now. The leaves are weighted down by the rain, lowering sometimes down into my face when I leave the cabin. Even with a rain jacket I can’t keep entirely dry. In my darker moments I am tempted to buy a machete. The rain covers the sounds of many of the forest residents, though perhaps there simply aren’t as many sounds as on clear days. I am not seeing the usual number of rabbits, raccoons, deer or even the fox as usual. Maybe they are hunkered down, waiting for the sun to reappear, as am I.
I’ve decided, at least in part, why I don’t particularly care for summer. Fall is a lot different from summer. The leaves change color, turning beautiful shades of red, orange and yellow. Eventually they fall off the trees entirely. The temperature grows noticeably cooler week by week, and the sky can be clear blue, change to blue and white and then to threatening and gray--all before noon. Winter is a lot different from fall. The temperature is cold. We (sometimes) get snow and ice. A whole range of fun outdoor activities can only be done in the winter and are possible again. The trees are bare. Spring is a lot different from winter. The snow melts, the temperatures warm. The forest starts to grow again and soon everything is green. The temperature warms week by week. Rain is common. And then there’s summer. It’s pretty much the same as spring, except hotter and more humid, perhaps with a bit less rain. Where’s the difference? Well, there isn’t much of one. I think part of my dislike for summer is simply that it doesn’t look much different from spring. I’m bored, I think. Summer, ho-hum, more of the same. At least that’s my theory for today. This weekend, I had both spring and summer—hot and cool, sun and rain, thunder and lightning. The chickens are still well and safe. Last night I decided to make a run to get some chicken wire to cover the top of the chicken pen. The tarp is great for shade and to keep the girls dry, but I kept thinking that if a smart (and heavy) fox jumped on top of it, it may well give way. 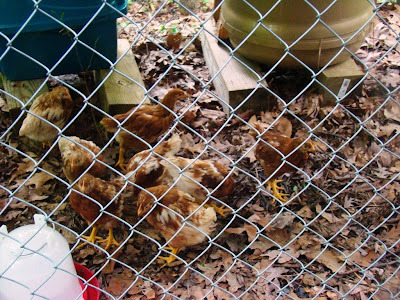 Hence, the chicken wire idea. So I pick that up at the local feed store, figuring I’ll get an early start on Saturday morning to further securing the chicken pen. Later that evening, I take Dog outside for his final run of the night, and I no sooner open the door but that I hear one of the local foxes barking. The fox was close, somewhere around the end of the lane. So I go back outside, now armed with my headlamp and what turns out to be the world’s dullest pair of wire cutters, to secure the chicken pen, all the while serenaded by the barking fox. The barking continued for well over half an hour, perhaps even 45 minutes. Sometimes it was a little closer, sometimes a bit further away. When a fox barks, it usually doesn’t mean, "Hey, over here! Free food." It’s more a "Where are you? I am here" call to the mate or kids so the separated foxes can reunite. Still, it’s not the kind of thing I want to hear that close to the chickens. The girls, asleep in their domed litter box, seem unperturbed during the entire tarp-covering process. Eventually I get the wire cut and the tarp covered with chicken wire. I still need to do something more around the bottom of the pen, but I think I’m okay for now. When I went back inside, the fox was still barking. My photo this Friday is the view from my cabin of the mountain to the west. Can’t see it? Neither can I. Hopefully it will still be there in the fall. Oh, and you can just see the edge of the chicken wire-covered pen in the lower, left-hand corner of the photo. For the moment at least, the weather on Roundtop is settling somewhere around normal again. No more frosts or near-frosts, no more chilly April rains in mid-May, and summer’s heat and humidity hasn’t found me yet. A three-day weekend edges ever closer. The fox didn’t make an appearance near the chicken coop last night either, so my mood is nearly as sunny as this morning. 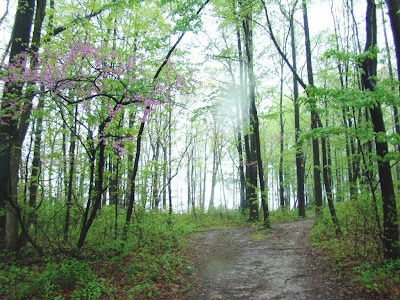 I am eager to have an extra day to spend exploring the spring season deeper into the forest than a weekday allows. Dog and Baby Dog both need to be tired out on a long walk, or at least an attempt made in that direction. My little vegetable garden needs some attention, too. This morning the local Canada geese were getting an early start to the holiday weekend, taking the five young ones on a trip to the new pond, marching them across the access road, down a lane and through the paintball fields. They were in a hurry too, just like the drivers on the highways of my commute. The forest canopy is nearly as thick as it will get, which means I can no longer see the view to the west, or in any other direction for that matter. My view of the sky is reduced to little pinpricks of light. To see what’s going on with the weather, I have to walk out to the intersection of my driveway and the lane. Even out there, I only get a little view of the sky, just enough to see a few clouds. So that doesn’t give me the whole picture. For that, I need to walk to the end of the lane, where the trees give way to open sky at the old pond. 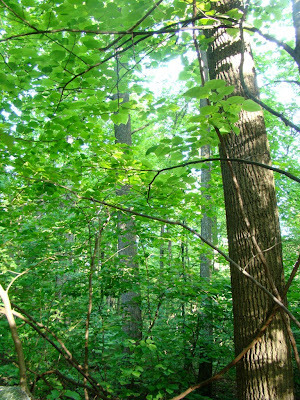 Until the denseness of the leafy canopy starts me feeling a bit claustrophobic, which likely won’t kick in until the hot days of July or August, the privacy afforded by the forest has its advantages. I’m not sure I will tell you what they are. You can come up with your own ideas. Let me just say that a person could pretty much do anything they wanted to and no one could see them doing it. And sometimes the idea of being able to do that is just as good as the reality of actually doing it. 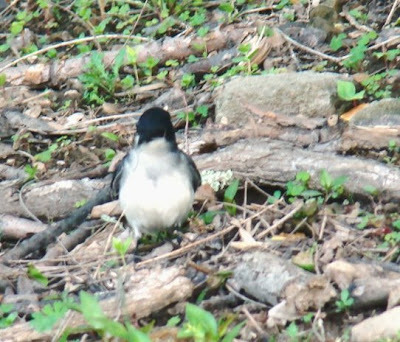 Now here’s another something I don’t see every day—an eastern kingbird on the ground. The kingbirds at Roundtop usually ply the air for insects over the grassy ski slopes. When they sit, it’s usually on a lift cable or fence railing. This one was actually bouncing around on the ground, which I’m sure is a first for me to observe. Also this morning, one of the local foxes has now seen my chickens. This morning when Dog and I left the cabin for our walk, Dog’s nose suddenly went into the air. He started prancing on tiptoe—both a sure sign that he didn’t like something. I didn’t see anything, and since Dog’s attention may be caught be anything from a fox to a deer to a skunk, we continued on our way. It was only when we were coming back to the cabin that I knew what he had sensed. At the end of our walk, we went over to the chicken pen. The girls were all out performing their morning dirt scratch when a bit of movement caught my eye. Perhaps 30 feet into the forest I saw the fox, quietly moving away. It stopped and stared for a bit before eventually disappearing into the woods. I hope the chain link fence is enough to keep him out. The tarp that is tied down to the top of the 4’ fence may not survive a fox jumping on top of it, though I don’t know if a fox can or could do that. I am reasonably sure the fox can’t dig his way in. The earth is a hard-packed driveway, covered with a thick layer of stones. Nothing has grown in the spot, that’s for sure. The chickens, I am reasonably sure, never saw the fox as they weren’t panicked. Even with a near-frost two nights ago, I have been sleeping with the bedroom window open so I can hear the chickens in case something tries to get at them at night. I’m not there during the day, though. Fox usually move primarily at the edges of daylight. I hope this one knows that. Last evening was beautiful—sunny, calm, great visibility, perhaps a tad cool but that’s splitting something at least as fine as a hair. I was off the mountain for much of the evening. Although that means I didn’t get to sit on the deck, coffee in hand and watch the sun set, I did get to enjoy the sights around the area, which was nearly as enjoyable. The night brought near-record cold for this time of year and threatened a frost, though I didn’t see any. I tossed an old blanket over the litter box/chicken coop, gave the girls a hot water bottle and hoped all would be well. This morning the chickens all seemed fine. Last night’s chill marks the end of chilly weather for a bit. Warmer weather and sun is on the way for the next several days, which my mini-container garden will much appreciate, I’m sure. The last of the summer migrants—the peewees--have arrived now. I love their little "pee-a-wee" call. They are the first and last singers of the day, their haunting call carries and echoes through the forest when it is nearly fully dark. At that time of day, their call is often the only sound I hear. No distant vehicle or people noises, no sounds of other birds or animals. That’s why their song carries so well and is heard over a long distance. The rest of the forest is asleep when the peewees call. They sing before everyone and everything else is awake or after the bustle of the day is over. Perhaps because they are such tiny birds, evolution favored them a little when their call didn’t compete with other sounds and songs. In any event, now that they are here, spring migration is officially over on Roundtop. Oh, perhaps some stray warbler will still pass, but all the regular species are now accounted for, and the forest symphony is reaching its crescendo. Today I’m posting a photo of my chickens, which are now grown large enough to be outside. For the past 5 weeks, I’ve had them in a hamster cage in my bedroom, growing them from day-old chicks under a brood lamp to the 5 week old babies you see here. 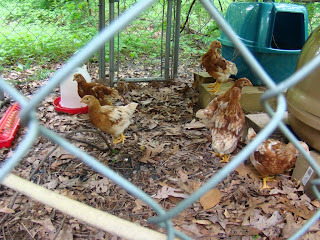 They are laying hens; the breed is Golden Comet. I am hoping to get eggs from them later this summer, my own little homegrown hedge against the economy and high food prices. Currently, I have eight, which is more than I will need to keep me in eggs. I expected to lose a few and figured having a few extra would be smart. So far none of them have died, but they have only been outside since Saturday, and going outside is a big step. Another part of my chicken experiment is that I didn’t want to spend a lot of money for my chicken arrangement. In the first place, as peeps, the chickens cost $2, and spending lots of money on $2 chickens doesn’t seem smart. Plus, if the chickens or their set-up cost more than the eggs they will hopefully lay, that wouldn’t be smart either. So, I used a chain-link dog run that the dogs hated for their outside pen, covered with a tarp. I did buy a $10 brood lamp, and a waterer and feeder ($2 each). Plus I’m currently using a fancy cat litter box with ramp, ($21) which they love, and an ordinary covered litter box, which they hate, both filled with straw from my dad’s barn. I will have to come up with something better for them by winter, but that gives me some time yet to hopefully scavenge something suitable. My arrangement should keep out raccoons and fox, hopefully. The hawks shouldn’t be able to get at them. Weasels would have a field day, but I’ve never seen a weasel here, and I hope they stay away long enough for me to find a semi-decent chicken shelter. For now, all is well, at least it was when I left the cabin this morning. 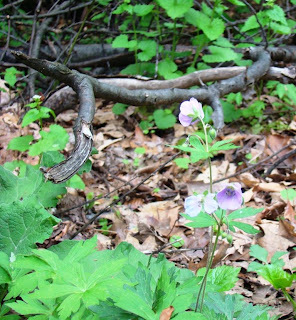 I know I’ve already posted a photo of wild geraniums this spring, but I couldn’t resist another one. The geraniums are especially nice this spring, and this bunch is huge, much larger than is typical. Geraniums prefer dry conditions, which it was here for most of the spring, if not at the moment. Sometimes, weather conditions favor what best suits one species. Just like in certain years strawberries are wonderful, and the next year they aren’t, the same is true of the forest’s plants. This year is particularly good for wild geraniums. The jury is still out on the strawberries. The recent rain on Roundtop has finally booted the ferns into action, and is likely responsible for helping this morel along too. 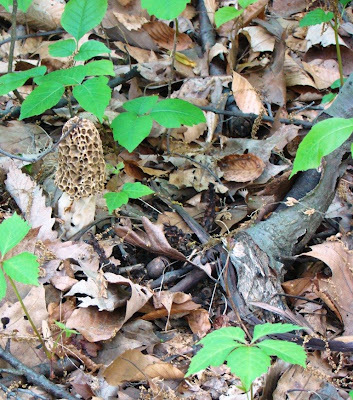 I found it growing in my front forest last evening, camouflaged so nicely that I almost missed it. The change from tinderbox to reasonably well-watered forest also brought a common garden toad into my driveway last evening, much to Dog’s delight. Dog knows well enough to keep his mouth shut around toads, but he can’t avoid nosing them when they jump. That’s simply too tempting. Last evening the forest was filled with the usual after-dark noises—a great horned owl down in the valley, a wood thrush that simply couldn’t settle for long after the sun was down, a deer stepping delicately if not silently across the leaves. The usual noises of a woodland night are ones I find comforting and relaxing. I sit outside in the warm evening. The darkness veils my sight and I focus instead on the sounds that tell much. The woods sound at peace, and I go back inside. 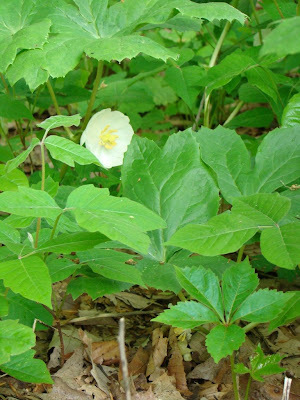 Today’s photo is the bloom of a mayapple, of which I have millions around the cabin. Okay, perhaps not millions, but really a lot. As the flowers are under the umbrella-like leaves, I have to get down on the ground, all the while avoiding the ubiquitous poison ivy (also seen here), to photograph these lovely flowers. The umbrella leaves are so thick that the flowers are easy to miss, which is a shame, as they are the equal of any hothouse flower sold in the local nurseries. Last night it was a quiet as the grave around the cabin, which immediately makes me suspicious. Even after dark, night noises are the norm, and when I can’t hear any sound I know something is up. The mostly likely explanation is a predator that is hidden by the dark. 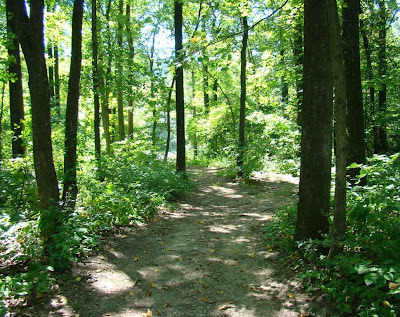 Often, like last night, I never find out what is going on, but I’ve learned over the years that when the woods are silent, it is time to pay extra attention when I am outside. When the woods are quiet, I tend not to wander far from the cabin in the dark, as I sometimes do on other nights. Perhaps that is an over abundance of caution, but so be it. Paying attention to the ebb and flow of life in the woods hasn’t steered me wrong yet, and I’m not going to start to ignore the signs now. If I start ignoring the signs when it’s likely nothing important, I may accidentally ignore something that is important. So I pay attention. Living here on the mountain means I have a ringside seat to observe the goings on in the woods around me. 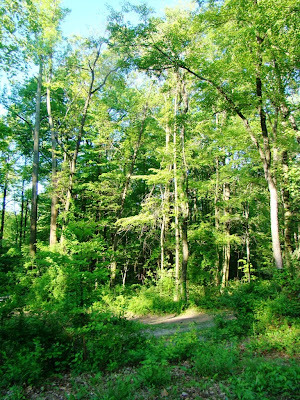 As woodland habitats go, Roundtop is great. It is not, however, a place where I normally see many sandpipers. Several places nearby are decent for shorebirds. The Susquehanna River serves as a major migration route. 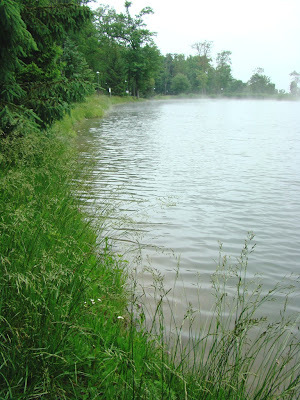 The nearby Pinchot Lake can also be decent for shorebirds. Roundtop Mtn. doesn’t fall into the decent range for shorebirds. Roundtop does have a few small ponds, though, and perhaps that and its proximity to decent shorebird paths combines to occasionally bring me a sandpiper to look at. Today’s photo of a spotted sandpiper is one of the few I semi-regularly get to see here. The birds never stay long. This is just a pit stop for them. This bird has been here since at least Saturday and will likely disappear in another day or so. In the fall, I might get to see them again. 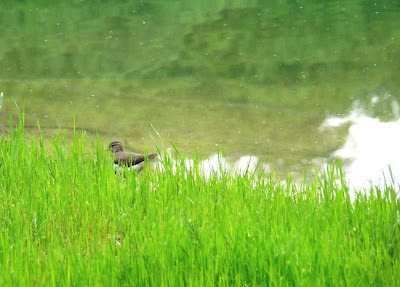 Spotted sandpipers are common and the kind most likely to be found around little ponds like those at Roundtop. Most self-respecting sandpipers wouldn’t deign to stop here, let alone dip their toes in the waters of ponds this small. Spotted sandpipers seem comfortable in small ponds or in the woods. I’ve seen them sitting on logs sticking up out of lakes. Other sandpipers probably think they’re odd. I don’t see many snakes here at Roundtop. I have often gone a year or more without seeing any at all. 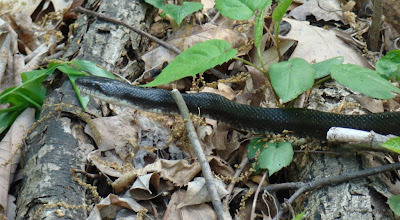 At least 95% of the ones I do see are black snakes, like this handsome one that I found yesterday. I’ve never seen a poisonous snake here, though I know they’re around. This one was about 4 ft. long, a decent length, though it was slimmer than some I’ve seen. Probably the weather this spring hasn’t been easy on reptiles. It’s dry, it’s wet. It’s hot, it’s cold. The changes are annoying enough for us warm-blooded creatures. I can’t imagine how the cold-bloods are doing with it. Yesterday was pleasant but cool, and I first found this snake at the corner of the dirt lane and my driveway. I pulled the car into the driveway, grabbed the camera, returned to the spot and in that short time the snake had moved. I thought my photo opportunity was past, but I slowly checked around and found the snake again, this time on the opposite side of the lane, just off the road. I grabbed a few shots and then let it alone. This clearing weather has brought a lot of new arrivals to my woods. The Canada geese have launched five new babies. The Eastern kingbirds have arrived on the slopes. On Sunday morning a pair of scarlet tanagers were curiously eyeing the dogs as we were all out on the back deck. Tanagers usually nest at Roundtop but often they are further down the slope of the mountain. That I saw a pair of them right overhead makes me hope they will nest close enough to keep an eye on them while they do it. I’ve certainly heard the male singing all around the cabin this weekend. Having them next close enough to see them regularly would be exciting. At this point, I think the only spring arrival I’m missing are the peewees, the latest of the summer residents. And they will be here soon. The rain held everything up for at least a week, but once that storm system cleared, that also cleared the way for the summer residents to show up and step out. My ivied hut among the pines. This 800 year old poem seems appropriate to me today. I found it on the daily zen site for May 8. The photo was taken at my parents' farm. Mom's pink dogwood tree is especially lush this year. Another .75 inch of rain fell on the mountain yesterday, most of it last evening. 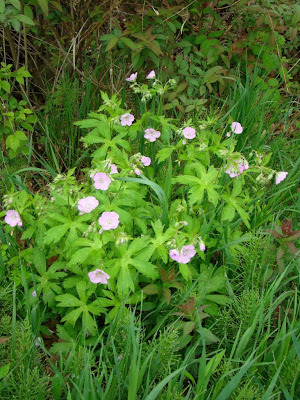 I managed to quickly snap a few photos of the wild geraniums around the cabin before the next round of rain hit. 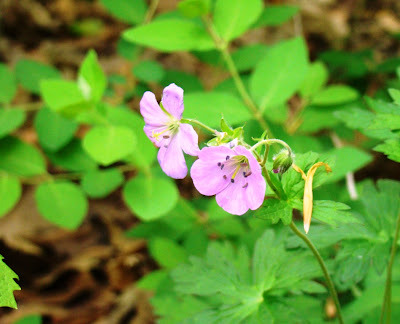 Right now, the geraniums are the most prevalent of the local wildflowers. I can’t walk along the side of the cabin without having to dodge them. There are dozens of them around the cabin right now. Lest you think that living in a cabins in the woods is all peace, quiet and wildflowers, the rain is forcing me to deal with a flooded basement. Even on a mountain, such things happen. In my case the water enters around the well casing. I’ve had plumbers look at it but none have yet come up with a good solution. It’s ground water from soaked ground, and even if I managed to completely block it at this entry point, the water would only go someplace else and the someplace else could be worse than where it goes now. Or so they say. As a result, over the years I have armed myself with a variety of pumps. My basement is nothing more than a small space that houses the hot water heater and the electrical panel—all of which are raised off the floor of the basement. The little space can quickly get several inches of water in it. If it’s been dry, it takes a good many inches of rain to flood it. In spring, I often get a flooded basement when the snow melts off the mountain. This rain, which has been going on since Saturday, has the mountain pretty saturated, and I wasn’t surprised to discover an inch of water in it this morning. I have both battery-powered pumps and an electric pump. The electric pump is a workhorse but requires a bit of work to set up. The battery-powered pumps are small, lightweight handheld things, originally designed for small sport boats. They are good for small jobs and have the advantage of working when the electricity is out. That wasn’t the case this time around, but it was after one such instance when my electric pump was useless that sent me looking for something that would work when I didn’t have power. This morning, I set up both battery-powered pumps, and both were sucking air within an hour. I still have a slightly wet basement. None of the pumps will pump when the depth is much less than .25 inch. At least I shouldn’t get any more rain today. Tonight, perhaps a few showers but apparently nothing measurable is expected to fall, for which I am grateful. I’d thought of making today’s post a Wordless Wednesday, since the headline says it all, but I guess I’m chattier than that. Rain continues here at Roundtop and will continue through around Saturday. Even a gentle rain can cause flooding if it lasts for a week, and that’s about the point we’re reached here on the mountain. The area needed rain. The gentle rain was much needed and appreciated. But now I feel like shouting, "enough, already!" In the space of a few days, the woods has gone from a tinderbox to a rain forest. The air is so moist that even I can identify the animals floating around the cabin by their smells. The skunk, of course, is an easy one. 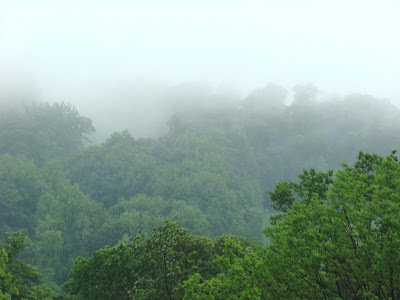 But the soupy, moist air also holds the scent of the fox, the raccoons and deer. The dogs, whose noses are far superior to mine, can scent without touching nose to track. They walk with noses in the air, excited and misbehaving with the mix of scents that must be overwhelming to them. To me, with a human’s notoriously weak sense of smell, the air makes scenting the different species possible. I can now tell what’s been around, but I’ll never be able to trail by scent the way the dogs can. That said, it’s still an interesting experience to notice so many smells when that’s not usually possible to do. Even though I can’t trail by scent, I do notice when a scent grows more or less intense, at least in a general way, as we walk along the lane. I guess this is as close as I will ever get to understanding how a dog trails. It’s not very close, I’m sure, but it’s certainly closer than usual. I think I’d prefer a little sunshine, though. Today's photo was taken off the mountain but looking up towards one bump of it. This morning I am living in that mist, which is even thicker up where I am. My favorite kind of evening at the cabin is one where I can sit outside on the deck after dinner, perhaps with a newspaper or a cup of coffee. I can listen to the forest goings on, watch the sky, perhaps see an interesting bird or watch the fox pick its way across the landscape. Last evening was not that evening. Instead it rained, quite a bit actually. The rain was gentle enough most of the time, but after 3 days of it, even a gentle rain amounts to quite a bit. Worse, at least from my point of view, I really didn’t spend the evening at the cabin. Indeed, I spent perhaps 10 minutes of the evening there. so my photo today was not taken at Roundtop. Instead, I took a photo of Beaver Creek flooding a meadow on the way to my evening event. This morning the rain has stopped for the moment, though the sky still looks as though it could start again at any time. I’ve learned over the years that once the ground gets saturated, as it is now, even a respite of a few hours with no rain is a good thing. April-like showers covered the mountain this first weekend in May. 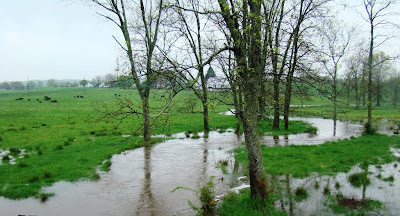 It’s been a good rain, the kind that soaks in, not the kind that runs off in rivulets. Sometimes the rain was hard enough to keep me inside, sometimes it was just a comfortable sprinkle. 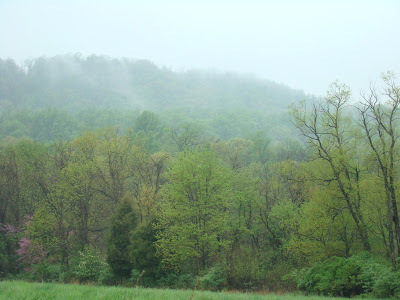 Always the landscape was misty or foggy, with ever more greenery coloring the woods. Ovenbirds have now arrived, to join the chorus with the wood thrush, whose lovely song carries throughout the forest. I’ve often wondered why that song seems to carry through the trees so well, and now I’ve learned the answer. I was sitting out on the front deck during one of the weekend’s rain free episodes when a wood thrush landed in a low tree just over my head. I didn’t move, so I wouldn’t scare it and was rewarded when it began to sing, I almost had to put my hands over my ears. When that bird is close, the song is loud, very loud. It’s still beautiful, of course, but another 10-15 feet of distance wouldn’t have hurt the beauty of the song one bit. The rain has finally kicked the ferns into new growth. They were looking pretty bad this spring. Some hadn’t even produced fiddleheads yet, but now they all seem to be growing again. For the moment, I have no new flowers around the woods, just more of the ones I’ve already photographed. That will soon change, probably as soon as the sun comes out again for a day or so, which might not be until next week. Are we sure this isn’t April? It sure feels like it, despite the calendar. 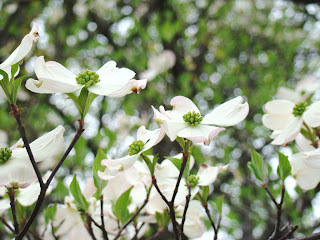 Flowering dogwood has now started its annual blooming, a process that tends to last at least a little longer than the glorious burst of color that appears during the leafing of the redbud trees. 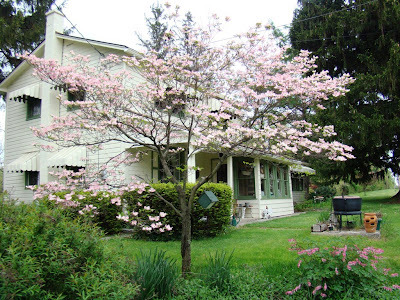 Unfortunately, this year the dogwood flowering appears less abundant than usual, while the redbuds are spectacular. It looks like redbud soup right now. 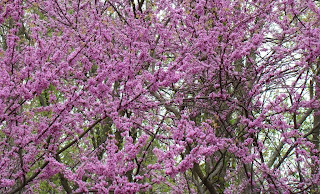 Perhaps the redbuds simply got pushed to bud all at once by the heat earlier this week. Dogwoods have always had a somewhat variable level of flowering, with some years naturally better than others. With this spring so dry here, that may be a reason for it. 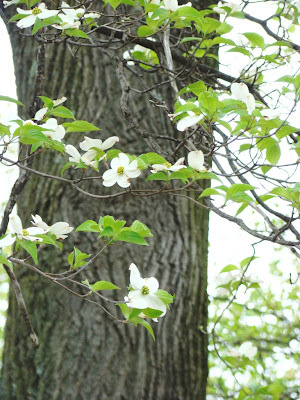 The reason may also be the "dogwood disease," a fungus really, that has caused the deaths of many of the trees throughout the east and the rest of the nation. The dogwood fungus first appears as brownish spots on the leaves, usually seen in late May or early June. The fungus eventually affects the tree’s stems and branches, killing them over time. Trees can take up to three years to die. Last year around Roundtop, I didn’t see any trees that appeared to be affected with the spots, though I confess I did not examine every tree I could find. I am hoping that this year’s diminished flowering is simply due to the dry spring. Spring here wouldn’t be spring without dogwood.